VMware’s vSAN software-defined storage product is being adopted like wildfire as many organizations are considering software-defined storage solutions with their current storage refresh objectives. Traditional storage in the way of SAN storage is now being considered as a second option in lieu of software-defined storage. The movement towards software-defined storage has matured to the point of confidence among enterprise environments today. Now, at the time of this writing vSAN customers are numbering between 15 and 20 thousand. The platform is certainly matured and has been tried and tested thoroughly. Additionally, with each new version of vSAN, VMware has continued to add major new features and functionality that has steadily closed the gap and even surpassed the functionality of traditional storage systems. At VMworld 2018 in Las Vegas, the announcement was made of the release of VMware vSphere 6.7 Update 1 which brought about exciting new features along with a new version of vSAN. In this post, we will take a look at VMware vSAN 6.7 Update 1 New Features and see what the platform has to offer for enterprise environments who migrate to the new platform. There are a number of great new features that extend the features and functionality of VMware vSAN 6.7 Update even further than previous releases. This release builds on the exciting new features that were found in the “non-Update 1” release of 6.7 vSAN which was a large release as well. 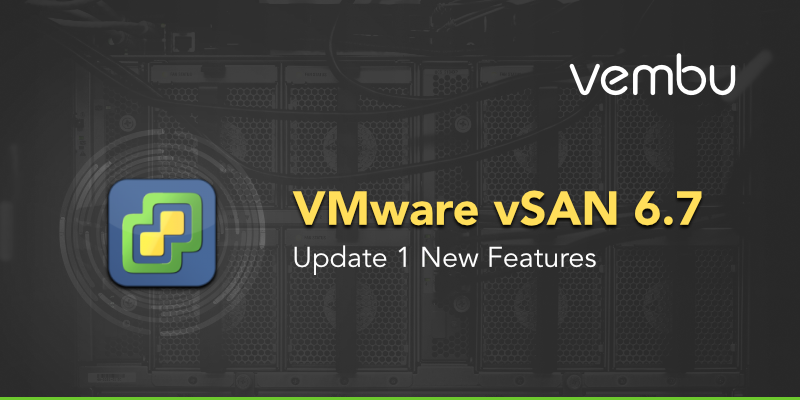 Let’s dive further into each of the above new features found in VMware vSAN 6.,7 Update 1 and get a better overview of the new enhancements brought about by each new or enhanced feature. VMware has poured a lot of time and work into revamping the UI in vSphere and by extension, vSAN. New with VMware vSphere 6.7 Update 1, in general, is a fully functional HTML 5 UI that no longer is handicapped to the point where you have to utilize the Flex client. 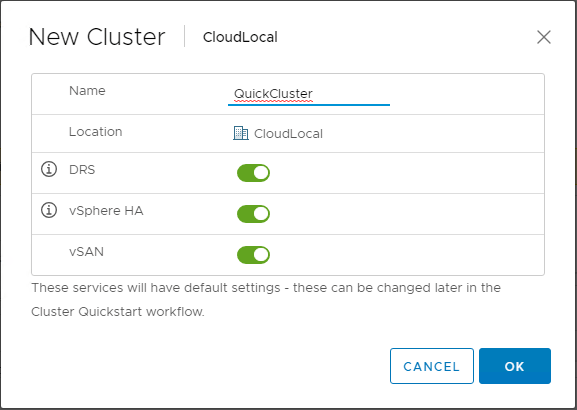 Newly introduced is the Cluster Quickstart Wizard in the vSphere client that allows a guided workflow for creating vSphere clusters. This includes the ability to enable vSAN and other initial configuration tasks such as configuring host, network, and vSphere settings on the cluster. In particular to vSAN it also allows easily adding new hosts to the vSAN cluster. This greatly simplified and intuitive process will help organizations improve supportability and manageability of vSphere clusters including those enabled with vSAN. VMware is making great efforts to improve the vSphere Update Manager or VUM in the latest releases of vSphere. New to vSphere 6.7 Update 1 vSAN, customers can use VUM to update the firmware on supported vendor storage controllers along with the normal vSphere updates. This is now part of the normal VUM remediation workflow. This remediation of the controller firmware can be performed both online or offline using OEM vendor firmware ISOs. Protecting your data with any storage solution is of utmost importance. VMware has done a lot of work with the maintenance mode workflow with evacuating data from the vSAN hosts and ensuring that data is available or showing what impact on data a maintenance mode operation will make. New with vSphere 6.7 Update 1, vSAN now performs a simulation of data evacuation before attempting the maintenance mode operation. It is first determined if the operation will succeed or fail. If it is determined the operation will fail, vSAN stops the operation before any resynchronization operation begins. Businesses need to be able to do better forecasting of resources when it comes to infrastructure. 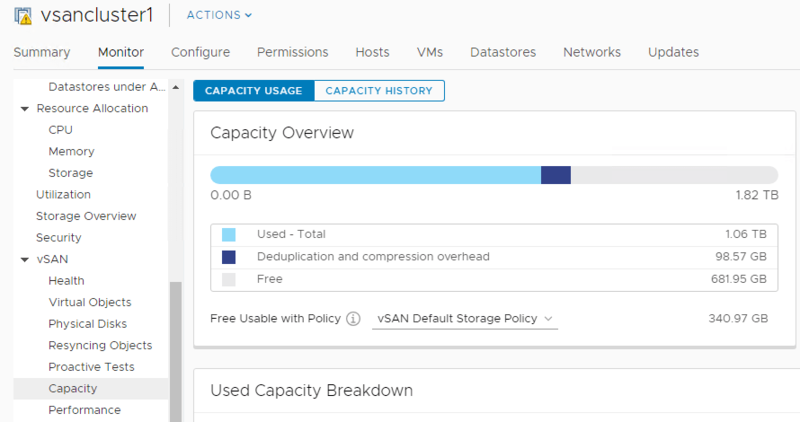 New with VMware vSAN 6.7 Update 1, there is the new historical capacity dashboard that reports on capacity usage over time. This allows organizations to effectively calculate capacity resources over time and when more resources may be needed. Additionally, this release contains a usable capacity estimator that helps to have visibility to the usable storage given the storage policy in use. VMware has certainly increased the capabilities of vSAN 6.7 Update 1 to be capacity and space aware. With VMware vSAN 6.7 Update 1, the guest operating system is now fully able to send TRIM/UNMAP commands that are able to reclaim allocated blocks when space is cleaned up from the guest operating system side. The new TRIM/UNMAP commands are able to be configured in automatic or offline mode. New with vSAN 6.7 Update 1, vSAN can support different MTU settings for witness traffic vs vSAN traffic. This helps to greatly increase flexibility with stretched clusters and 2-node clusters that use witness traffic separation. Health checks are important in a software-defined storage infrastructure. VMware has built in some great default health checks within the vSAN environment. With vSAN 6.7 Update 1, there is a storage controller firmware health check that supports multiple approved firmware levels. You can also purge inaccessible swap objects that are no longer needed. All hosts have matching subnets check has also been removed. The network test that is now based on Unicast traffic which is now used in vSAN has been added back. It determines if all hosts have proper connectivity and bandwidth requirements based on the recommended values from VMware. Now with vSAN 6.7 Update 1 and VCSA 6.7 Update 1, the vROps 7.0 dashboards pertaining to vSAN stretched clusters are integrated right into vCenter Server. The information pulled from vROps is displayed in the vCenter vSphere client. Much better support diagnostics have been built right into vSAN. This greatly reduces the need to upload support log bundles to the VMware Global Support team in resolving issues related to vSAN. Specialized performance dashboards in vCenter Server and the on-demand network diagnostic tests help to give a clear picture of the environment for the support engineers working cases. New Advanced settings allow configuring component repair delay timer, enable/disable thin swap files, site read locality and large cluster support from the Advanced settings dialog box. This is found in the Configure >> vSAN >> Services >> Advanced Settings configuration. VMware vSphere 6.7 Update 1 contains tremendously powerful new features that greatly enhance the features and functionality for enterprise environments running on top of VMware vSphere. When focusing in on vSAN specific new features, as we have covered in this post, there are many great new features that extend vSAN capabilities. Some of the powerful new features include the greatly streamlined and enhanced new UI, VUM enhancements, TRIM/UNMAP guest operating system features, enhanced health checks, historic capacity metrics and capacity estimator, and many other new features. This is certainly a worthy vSAN upgrade for any environment running on VMware’s software-defined storage infrastructure.